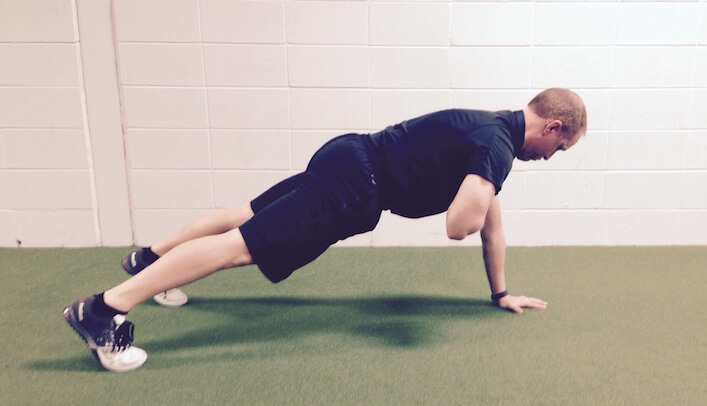 Learn the benefits of the Push-Up to Single-Arm Support. Much like the Renegade Row, the Push-Up to Single-Arm Support is a terrific total-body exercise. First and foremost, you get the benefits of reaching, which I've touted numerous times here. Second, when you go into a single-arm support position, you really overload your core, and emphasize its ability to resist rotation. Take your feet out a bit wider than normal. If you're too narrow, it will be incredibly difficult, especially early on. I often cue an exhale (the Breathing Push-Up), which helps get the abs and core into an optimal position. Next time you're in the gym and want a fun push-up variation, give this one a shot. Enjoy! This article originally appeared on RobertsonTrainingSystems.com as "RTS Coaching: Push-Up to Single-Arm Support." The author, Mike Robertson, is the President of Robertson Training Systems and co-owner of Indianapolis Fitness and Sports Training (IFAST).